2019 sees the 80th Anniversary of the outbreak of WWII, just 21 years after the end of the ‘war to end all wars’, and at the Yorkshire Air Museum you can explore the role of aircraft and the people who flew them in the conquest of tyranny. It is also the 75th Anniversary of the formation of the two French Squadrons of RAF Bomber Command, who uniquely flew from Elvington with Halifax Mk. III bombers. See the only complete WWII Halifax bomber in Europe, climb aboard the Douglas C-47 Dakota, the aircraft famed for its role in the airborne invasion of the D-Day Landings and stand up close to our examples of the famous WWII Spitfire and Hurricane fighters. 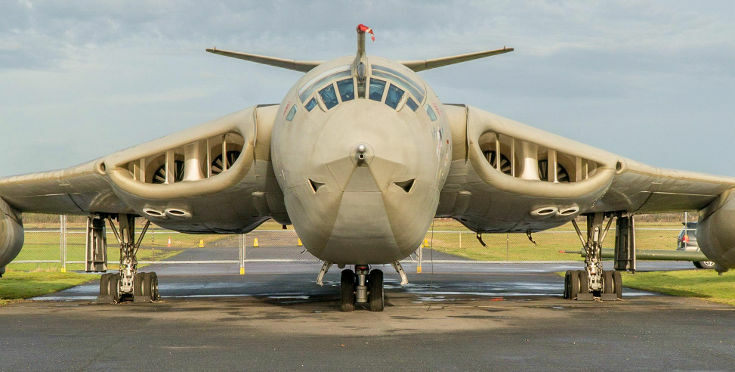 You will also find a Gloster Meteor, Britain’s first jet fighter and many aircraft from the Cold War era with exciting, evocative names such as Lightning, Hunter, the Yorkshire built Blackburn Buccaneer, Nimrod and the awesome and still futuristic looking Victor V-Bomber. From the birth of flight, you can also see the only example of Sir George Cayley’s historic man-carrying glider of 1853, the only full size replica in Europe of a Wright Flyer, the world’s first powered aircraft, and the intriguing Blackburn Mercury Monoplane. Newly on display and creating a great deal of interest is the Dassault Mirage IV strategic, supersonic nuclear bomber, gifted to the Museum by the French Government, which is the only example of this type to be seen in the world outside of France. This imposing aircraft makes a rare, and possibly unique, pairing with its smaller variant the Mirage III supersonic fighter here at Elvington. There is indeed a great deal for the visitor to discover during a day out with us. Based on an authentic WWII Bomber Command Station, the former RAF Elvington, we maintain the authentic atmosphere of the period, whilst housing superb displays and exhibits, such as the Bomber Command exhibition “Against the Odds”, which is now the definitive national presentation on this subject. Similarly, the “Pioneers of Aviation” exhibition provides a fascinating insight into Yorkshire’s literally ground -breaking role in the birth of manned flight, with Sir George Cayley, renowned as the Father of Aeronautics and the inventor of the aeroplane, who was born in Scarborough in December 1773. The exhibition also explores Leeds born Robert Blackburn who established a hugely successful aircraft manufacturing business; Hull born aviator Amy Johnson, whose daring exploits and solo flights to Australia and South Africa are indeed the stuff of legend. The work of Sir Barnes Wallis on the R101 airship at Howden is also explored and the exhibition features a dramatic interpretation of the famous ‘Dambuster raids’ with the Bouncing Bomb. The Museum prides itself on being a dedicated Memorial to the Allied Air Forces and the tranquil Memorial Gardens provide a peaceful haven to reflect on the service and sacrifice of so many brave young airmen and women, from WWI to the present day. With so much to see, we have an excellent restaurant in which visitors can enjoy a tasty meal, snacks and refreshments during their stay with us. 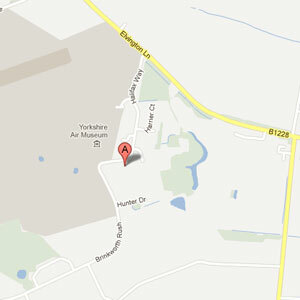 Most importantly, the Museum is a place of discovery and certainly much more than just an air museum! Family: £28 (2A + 3C).